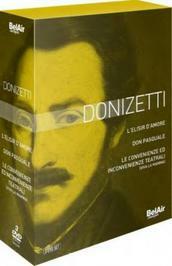 Three Donizetti masterpieces in a limited edition box set of internationally acclaimed productions. 'Le Convenzione ed Inconvenienze Teatrali' was inspired by two comedies written by Antonio Simone Sografi between 1794 and 1816. It follows the theatrical tradition of Goldoni, Gozzi and Metastasio, and subjects the bad habits of the operatic world to biting and sardonic criticism.